Nigeria's incumbent President Muhammadu Buhari has been endorsed by a staggering 53 political parties. 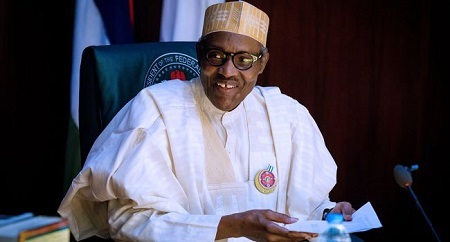 Ahead of the Saturday mega rally of the All Progressives Congress (APC) in Lagos, a coalition of 53 political parties has endorsed the candidacy of President Muhammadu Buhari, saying the decision was based on the president’s achievements in the last three years, [b]TheNation has reported. The coalition, under the banner of Coalition of Political Parties in Lagos State (COPPILS), declared its support for Buhari at an event held in Surulere. The event was witnessed by the Minister for Works, Power and Housing, Mr Babatunde Fashola, SAN, APC’s National Legal Adviser, Babatunde Ogala, the party’s governorship candidate in Lagos, Mr Babajide Sanwo-Olu, and lawmaker representing Lagos East in the Senate, Gbenga Ashafa, among others. Director of Publicity of the coalition, Mallam Shakirudeen Olofin, said the 53 parties had directed their members to work with the APC to deliver Lagos to Buhari, noting that they took the decision to support the APC presidential candidate because of the infrastructure projects of Buhari administration in the Southwest. According to a communiqué issued by the coalition and signed by its convener, Hon. Akinola Obadia, the APC-led Federal Government had sited more projects in Lagos to consolidate the status of the state as the fastest growing economy in Africa. The coalition said the strides must be sustained for sustainable development. Hailing the decision of parties to support President Buhari’s re-election bid, Fashola said Lagos residents had no choice than to return APC to power. He said the People’s Democratic Party (PDP), in its 16 years dominance at the centre, left infrastructure in the state to rot, pointing out that the opposition party’s candidate, Atiku Abubakar, had no plan for the country. Fashola described the PDP presidential candidate’s policy paper as “strategy of lies”, saying Atiku’s plan is impracticable. He said Buhari’s investment in infrastructural renewal was unprecedented, adding that the “Next Level” slogan of the APC was strategically coined in preparation for the projected job creation and economic upswing that would come as dividends of Buhari’s investment in infrastructure. Sanwo-Olu said Buhari’s achievements in four years could not be compared to PDP’s 16 years in power, saying the APC-led Federal Government had initiated and completed 143 road projects across the nation since 2015. He said Buhari’s victory at the general election must be collective responsibility.